← When does the Green Deal come into effect? Only authorised Green Deal installers will be able to install energy efficiency home improvements under the Green Deal scheme and they can be easily identified by the Green Deal Mark. 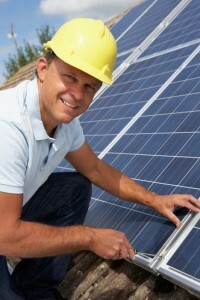 Whether individual sole traders of big companies, accreditation as a Green Deal installer is open to anyone. However they must be a member of the certification body which certified them and must also abide by the Green Deal Code of Practice. The Government is determined that their flagship home insulation scheme won’t be tarnished by poor workmanship and that is why any work undertaken through the programme can only be carried out by certified Green Deal installers. The Green Deal Code of Practice essentially underpins the scheme and sets out principles which assessors, installers and providers must adhere to. The Code has been established to ensure that those engaging in the Green Deal scheme operate fairly and with transparency which will instill confidence in customers signing up for the Green Deal. Anyone signing up for the scheme can have confidence in the people they are dealing with, not least that they have received the necessary and appropriate training. If any issues arise customers can take their complaints to an independent Green Deal Ombudsman. Green Deal installers can be safe in the knowledge that they are taking part in a robust scheme that demands high standards from all its participants. The Department of Energy and Climate Change (DECC) has appointed the United Kingdom Accreditation Service (UKAS) to offer certification bodies accreditation to certify Green Deal assessors and installers. Certification bodies, which currently include Certass, Fensa, OFTEC, NICEIC and the Energy Saving Trust, are responsible for registering installers with the Oversight and Registration Body and have the authority to license use of the Green Deal Quality Mark. Installers accredited with the Microgeneration Certification Scheme (MCS) and Gas Safe Register will have their own process to adhere to. For any installer wishing to become accredited as a Green Deal installer they must be certified by a Green Deal accredited certification body as meeting the standard PAS 2030 which provides a specification for the installation of energy efficiency measures in existing buildings. More information about Green Deal certification bodies can be found by visiting the Green Deal Oversight and Registration Body website.